Fireworks are illegal in my state. I mean, the big ones are. We can buy sparklers and other feeble pyrotechnics, but if you want to buy anything more exciting (see also: dangerous), you have to go to a neighboring state. I think a lot of our other neighbor states also outlaw firework sales, so Missouri is the common destination for those wishing to light up the sky. 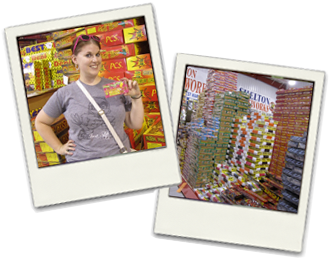 I’ve been through Missouri several times lately, and no matter which highway you take, there is a gigantic firework warehouse to greet you not far from the border. Each time, it vaguely occurred to me that we should stop, because I had it on my list, after all. On our way back from Kansas City earlier this month, my brother in law decided that he really wanted to buy some fireworks, and I seconded the motion for a pit stop. The giant red building, plastered with “NO SMOKING!!! OMG FOR THE LOVE OF GOD NO SMOKING!!! signs (okay, I might be paraphrasing), was fairly busy, given that it was mere days before Independence Day, which is prime firework time. It’s also your best bet to be able to shoot them off without drawing too much interest from the authorities. They tend to let you get away with a little more when it’s the 4th of July. It’s quite patriotic of them, really. I picked some small ground-based pieces (ground blooms! Glitter bombs!) that set me back about $2-3 (hey, it’s merely the act of purchasing that constitutes a successful checkmark on the list). Because it was pre-holiday weekend, they were giving freebies with purchases. My BIL joked that I wasn’t going to get any because my purchase was so small. The bag girl smiled and gave me something anyway. Turns out, the freebie I got was worth more than my total purchase price. Go figure. There was only the slightest of thrills crossing back over the border with our contraband. I mean, it’s not like there are customs officers on the state lines or anything. Also, the stuff I ended up with was pretty tame – to the point where they might even be legal here at home. Ah, well. I guess I’ll have to save my act of rebellion for another time.